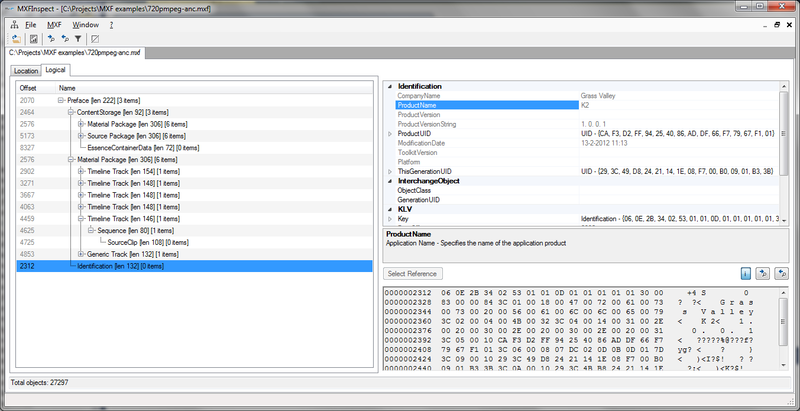 MXF Inspect is a fully functional and completely free Windows tool to display the internal structure of a MXF (Material eXchange Format) file. It can NOT play the MXF movie itself. There is no demo and advanced mode, it is completely free. The application is tested on Windows 7 and Windows 8. MXF files are extensively used in the broadcast industry. Since I am working in the broadcast industries, I personally use a lot of MXF files. I wanted to determine if certain MXF files were valid but could not find any good (free) tools on the internet so I decided to make my own. The source code is released under the GPL and can be downloaded below. 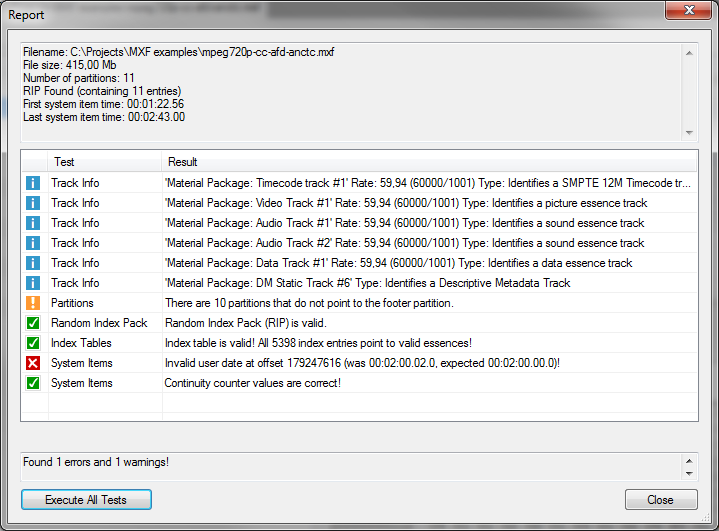 The latest version of MXF Inspect, version 2.2.0.4, introduces some new functionality. Large file support: It is now possible to load very huge MXF files (several Gigabyte) in seconds. Since the previous version was parsing the entire MXF file, it could take minutes to open large MXF files. The reading mechanism has been completely rewritten. When opening a new MXF file, MXF inspect starts by reading the header, footer partition and the first body partition and will then stop reading. Whenever a new partition is opened in the tree, that partition will be read from disk. It is possible to change this behavior in the (new) settings dialog, called ‘partial-loading‘. ‘Syntax‘ coloring: Different types of metadata can be given separate colors so it is easier to discontinuous between the different types. The colors can be customized in the settings dialog. The following colors can be changed: Partition, Essences, Index Tables, RIP, System Items, Meta data, Fillers and Specials. Settings dialog: Introduced a settings dialog. The ‘Index table test’ is not executed automatically when a file is partially loaded (the test requires all data to be loaded). By pressing the new button ‘Execute all tests‘ in the report screen, the test will be executed. This will result in a delay since the entire file must then be loaded. Disabled the UI when a MXF file is loading (this to prevent crashes when loading a file and selecting menu items). Open multiple MXF files at once. View offsets, parsed MXF data and raw data in a glance. Offset and Logical view present. Jump to the next/previous object of the same type. Only show/filter the current object type. Check if every entry in all index tables point to valid essences. Test if the user dates in all system items (if present) increase correct (no jumps present). 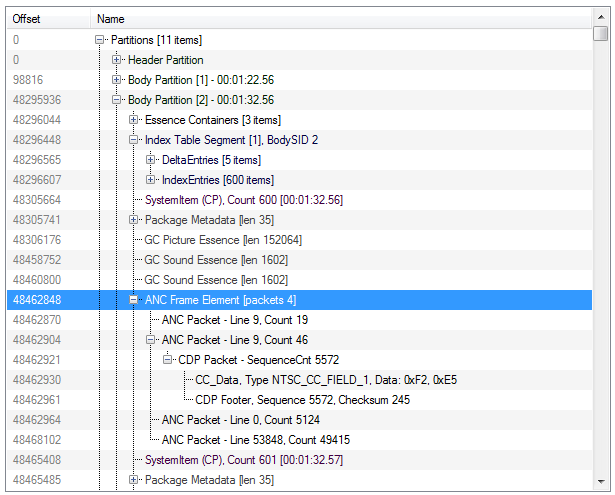 Test continuity counter of the system items increases. This application does NOT implement the WHOLE SMPTE-MXF specifications. This program is distributed in the hope that it will be useful, but WITHOUT ANY WARRANTY; without even the implied warranty of MERCHANTABILITY or FITNESS FOR A PARTICULAR PURPOSE. See the GNU General Public License for more details. Executing the setup program will install the MXF Inspect application in the program files folder. Improve the tracks information display in the report screen. Logical view should also include the logical track object hierarchy, maybe include the data itself. Ability to display the real subtitles information. Search and jump to a specific date/time/frame number.